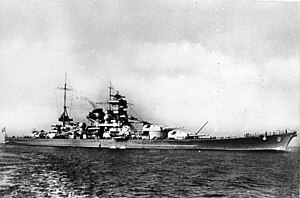 The Battleships Scharnhorst and Gneisenau sail from the Baltic to the Atlantic, causing absolute havoc to shipping routes and timetables. RAF reconnaissance planes report that the Italians are beginning to evacuate Benghazi in a withdrawal towards El Agheila. The 7th Armoured Division is given immediate instructions to advance from Mechili across the desert in order to cut off the Italians escape route. The Afrika Korps recaptures Derna. In North Africa, British retreat from German drive ends at Gazala, Libya. Hahas Pasha forms a new Egyptian Cabinet, becomes the Military Governor and dissolves Parliament the next day. Japanese take Ambon, Netherlands East Indies from small Australian garrison. British seize Egyptian palace in Cairo to force the abdication of pro-Axis King Farouk. The British refuse to surrender at Singapore, heavy bombardment by the Japanese continues for 4 days. Red Army troops achieve a landing near the Black Sea port of Novorossiysk. General Bernard Montgomery’s British Eighth Army crosses from Libya into Tunisia. European Theater of Operations (ETO) branches into North African Theater of Operations (NATO) in North Africa and Mediterranean under General Dwight Eisenhower and ETO (UK, Iceland, continental Europe except Spain and Italy) under General Frank Andrews. The Germans start their offensive to relieve the Korsun pocket. Chinese advances in Hukawng Valley, continue while the Japanese offensive on Arakan front gains strength in order to push the British back into India. US forces take Kwajalein Island in Marshall’s, losing 486 killed and 1,495 wounded, but inflicting 8,386 casualties on the Japanese. 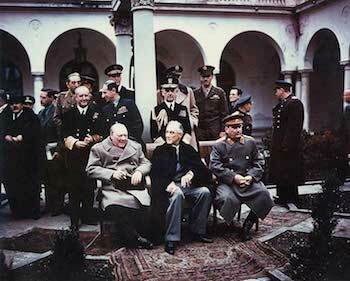 Yalta Conference begins: A summit conference between Stalin, Churchill and Roosevelt opens at Yalta in Crimea, to discuss plans for the treatment of postwar Germany, its division into zones of occupation, reparations and the future Polish western border. The U.S. First Army takes the first of seven Ruhr dams. Belgium is now reported as completely free of German troops. First Allied truck convoy over the reopened Burma Road arrives in Kunming, China. Mamoru Shigemitsu Quote “Hell is on us.